We had the BEST time at Patchwork yesterday, thank you for coming out and showing your support for handmade :) We debuted a couple of new products that I'm really excited about. The mini's fit perfectly in planners and calendars and I think they would look pretty awesome in scrapbook pages too. I'm going to give it a go. The larger notepads are for more doodles than lists. I'm also a big time doodler. When I used to have to be at certain meetings the only way I could keep my attention was by doodling. It really didn't pan out with my boss because he always thought I was just not paying attention lol! But I always did take good notes AND had pretty drawings so win win! I'm so glad we're not all the same. hahaa! So go ahead and doodle & list make to your hearts content. 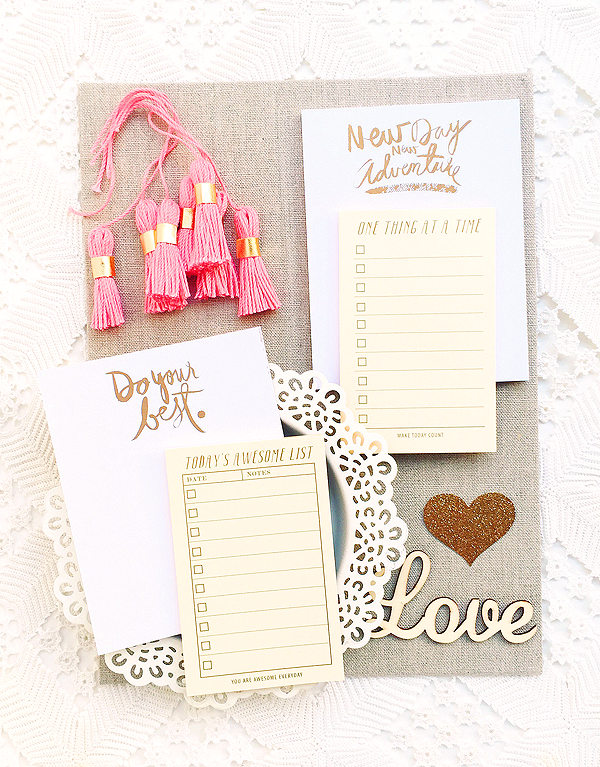 There's a special on the Gold bundle in the shop, all 4 notepads for only $17. 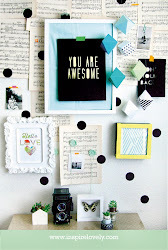 You'd totally be set for gift giving! My other favorite was creating a few new prints. I wanted phrases and quotes that motivate me. Maybe its the spring cleaning that I need to get done around here but its all leading me to get my act together and get things done. 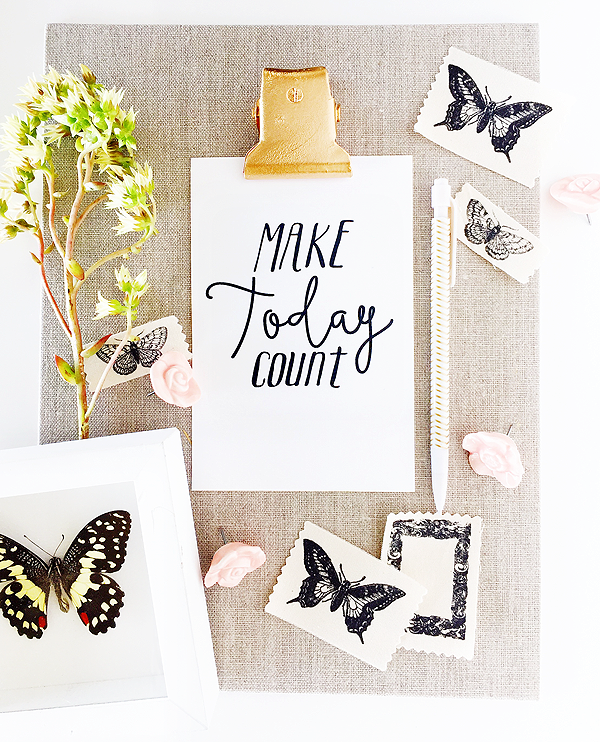 I love this one, "Make today count". As the days fly by it truly is a great reminder to make everyday count. So lets make it a good one yes? high 5! 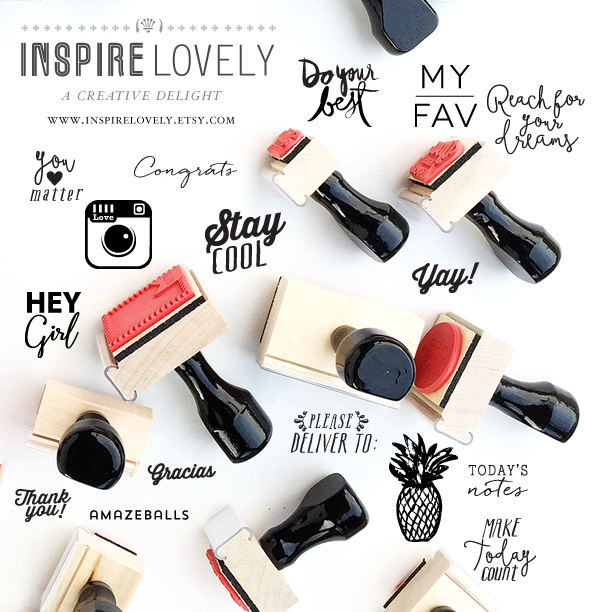 And these babies: 15 new stamp designs! Over the last few months I've been making a list from requests for stamps. I'm happy to have made these from that awesome list! Oh I know that summer isn't here yet but goodness am I excited! especially with the flamingo stickers :) I take Rafael to the zoo and we both love those silly guys. So I drew a few and made them into stickers for you too. You can get a pack with all these designs for only $7! 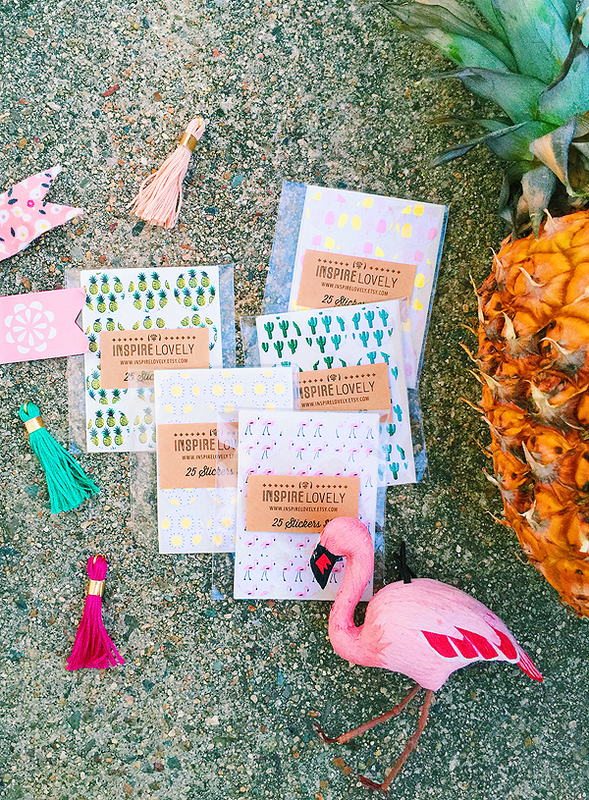 And another fun product: Confetti pops & new Tags. 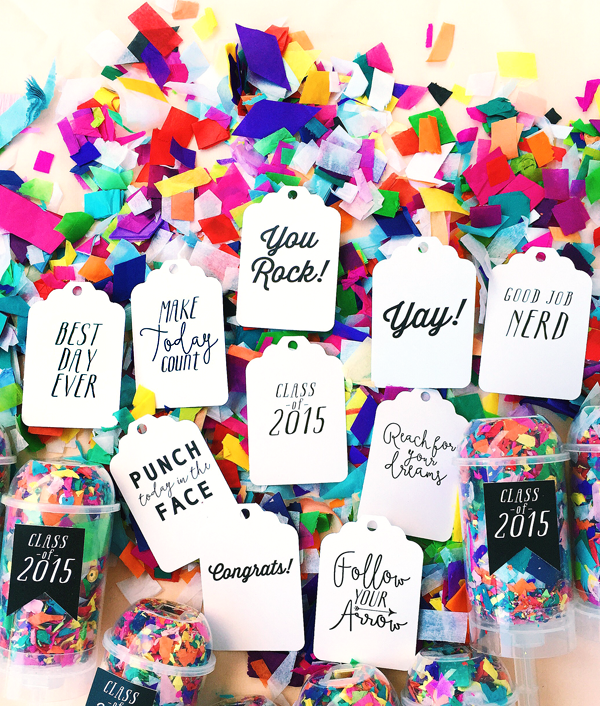 The Confetti pops are filled with tissue + sequins + confetti & embellished with your choice of label. You can even request a custom label free of charge :) Perfect for party people yeaaaaaaah! The tags were a bit of cheer & congrats for graduation. It all started with the tag " Good job NERD". Which is what I used to tell my little sister. She was always doing great in school and I was very proud of her but also wanted to make her laugh lol! Ahh nerds, so cool. So I guess it's pretty obvious what I'm going to give my friends and family for graduation gifts hehee. And today is your lucky day friends, I'm so excited about these handmade products I wanted to share a 20% off coupon code: "20OFF" all orders over $10. The coupon is good until tomorrow so have fun and I hope you enjoy the new shop goodies! You guys this is my favorite show & area to sell our handmade goods. It's the right people. The perfect atmosphere. The best food. I love offering GOOD deals at this market so come by!